Marsha found this video. We scheduled a meeting for several hours while some of the marches happened. Great video. The music is The Funeral by Band of Horses. Lambert is making fun of me for being a geek and posting on my iPad. Marsha is here as well. beeyoutiful and has eyes the color of purple pansies. So far, we have been interviewed by Agence France Press, met the guys from San Diego who got thrown off the Greyhound bus in Amarillo, Texas and some nice seniors from Wallace Wallace Washington who are stirring up other seniors over medicare. This is a mixed age group. We’re just now starting the GA. They’re going over the finger signals right now. I’m attaching some pics to the bottom of this post. We will have a lot more stuff to share a little later. Weather here is gray and lightly rainy. The ground is a mud pit. We are having fun. 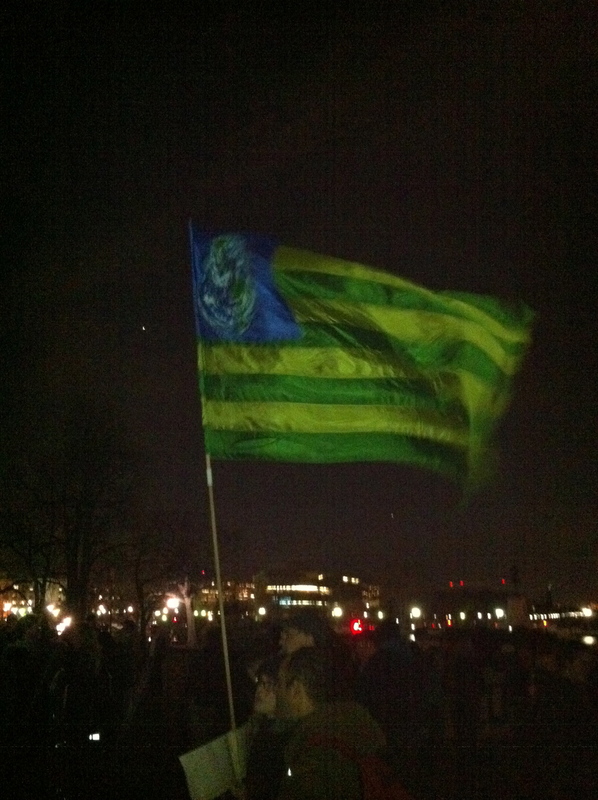 #J17- Happy Birthday OWS. 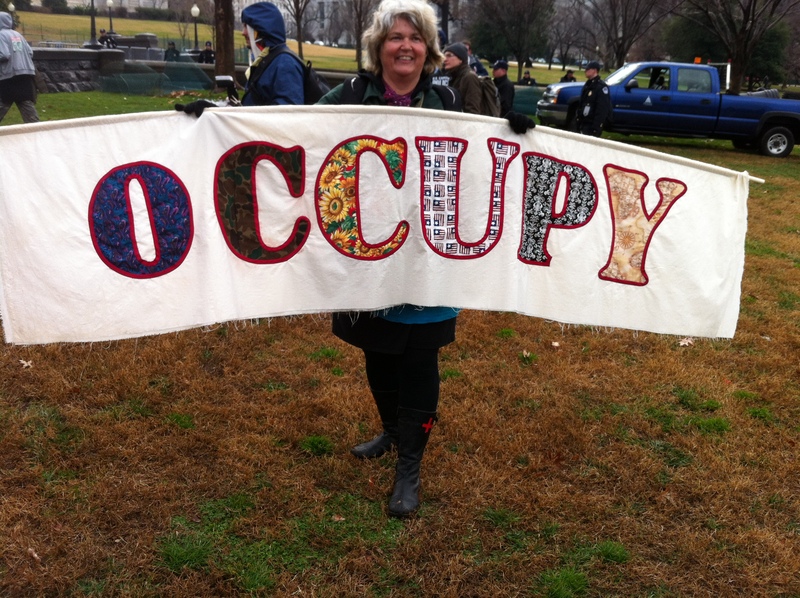 Let’s Occupy Congress! In Chaplin’s speech, he quoted the Gospel of Luke, which I think is so much better than John 3:16. I’ve got a ticket to ride. Gettin’ up at 4:00am to be there when Congress opens tomorrow. I’ll be meeting with Marsha, Lambert and some of the other Correntians. If I’m not mistaken, Lambert is also planning a Virtually Speaking broadcast with Avedon Carol tomorrow night at 9:00 EST so be sure to check that out. If you would like to help defray the cost of the trip, please see the donate button to the upper left side of the screen. We should have just enough in the PayPal account to cover it but it never hurts to plan for unexpected incarcerations and bail. Recommended donation is $10.17. I’d like to say thank you to all of you who have contributed. It means a lot to me. So, I will be packing my chargers tonight and turning in early to get up even earlier. For those of you who want to hear more Charlie Chaplin, here is the entirety of his speech from The Dictator. He wrote this himself. Enjoy! I had lunch with some former colleagues last week and told them I was going to Occupy Congress next week. Some of them looked like I had lost my mind while others were curious. One of them grew up in the former Soviet Union. Once I assured him that I wasn’t marching for a grand socialist solution, we had an interesting conversation. He told me that in his country, the KGB put a label on you, he gestured to his forehead, and never let you alone. He said, “Don’t misunderstand me, I am on your side, but what you are dealing with is not just in this country. It’s global.” And then he gave me a knowing look and, ya’ know, I think I got it. That was a weird feeling and not necessarily in a good way. I’ve mentioned this before but it bears repeating, we are now engaged in a struggle between global authoritarianism and small “l” liberalism. This is a global event. It’s the shock doctrine on a universal scale. It’s why there’s a push for austerity everywhere. Too often, Americans see their politics on a small scale, as if what happens here is just like the political superbowl between two teams that meet every four years. The media covers the players in the same way with statistics and color commentary. The primaries are like the playoffs leading to the big one in November complete with nachos and guacamole and a lot of beer. It’s a process unique to Americans, just another Detroit vs Green Bay. But that’s not what’s happening anymore. Our electoral process seems local but it’s part of a global pattern where the players are picked by a small evil group to which no one we know belongs. And they are presented to us in a process where the outcome is pre-ordained. In fact, I don’t think we Americans have actually picked our president since 1996. In every electoral contest since then, the good guys have lost. I am not referring to McCain. You THINK you have a choice but you don’t. It’s time to face up to that fact. If progressives were smart, they would stop playing this game and at least expose it, even if they feel (incorrectly, IMHO) they can’t do anything about it this go around. As long as they still think that this is a contest between Barack Obama and whoever the Republicans pick, progressives are dooming us whatever the authoritarians want. The answer is not to try to influence the Republicans. You are wasting your time and playing their game. The answer is to try to put the screws to the Democrats. And it is a very good idea to find out who the authoritarians most fear. Otherwise, we may wake up in mid-November to the same situation they have in Hungary right now where the ruling party has rewritten the constitution and has cemented its future electoral victories in place for a couple generations. Have courage, friends. The days of comfort for the soft American are over. I’m off to Philly today to do some work type things. Later Taters. 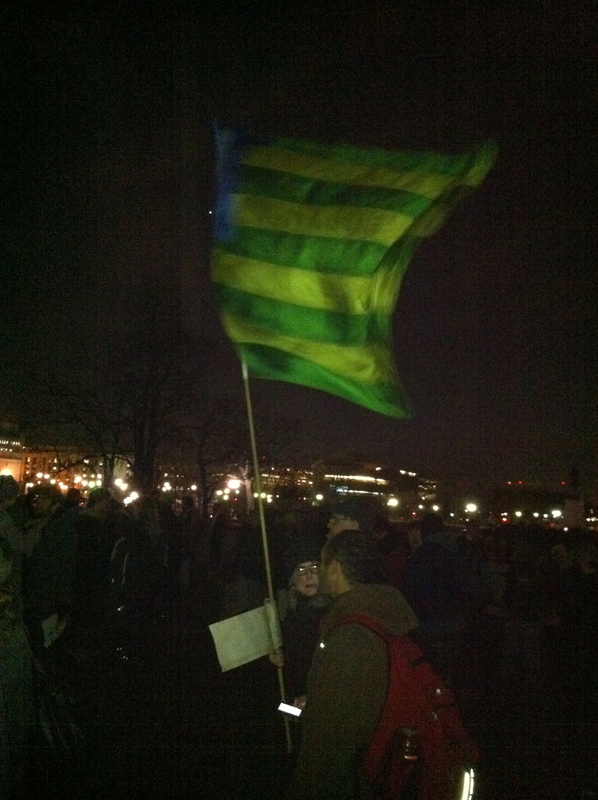 Update: Here’s some coverage from TPM on Occupy Iowa Caucuses. The occupiers are suggesting that Iowans go to their caucuses and declare themselves uncommitted to demonstrate their dissatisfaction with the slate of candidates of BOTH parties. That’s going to have more of an impact on the Democratic slate, IMHO. And this is not a joke. It’s not supposed to be humorous. It’s a genuine statement of disgust and will signal to the parties (especially the party currently in charge) that they cannot serve two masters. They’re going to have to choose: the masters with the money but not the votes or the masters with the votes and no money. I’m wondering if Occupy Iowa is going to get an assist of some sort from Occupy Chicago. The Chicago Occupiers have a knack for clever direct action events. This should be interesting. 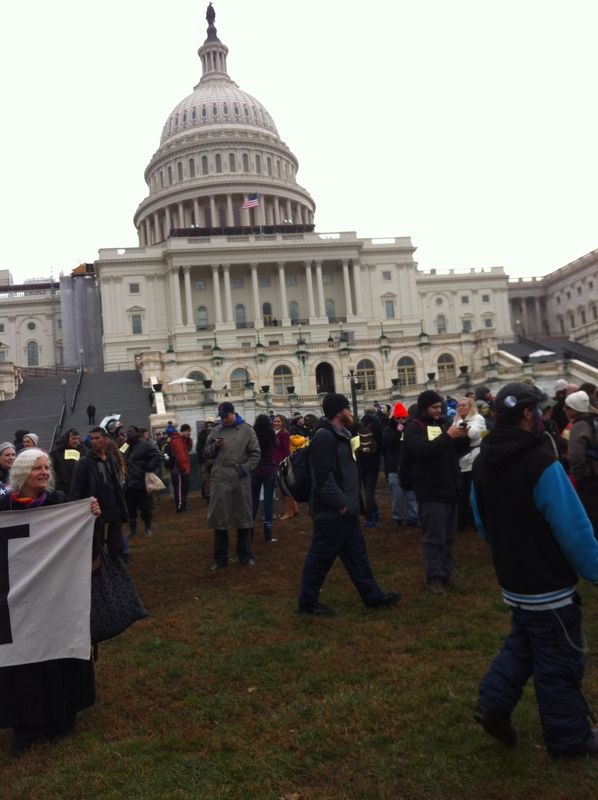 At the Occupy Congress logistics page, you can find several transportation options. There’s no excuse not to go. Buses are leaving to go to Washington, DC from all over the east coast and even as far west as Texas. Reservations on an Occupy Bus are cheap. My reservation from Trenton was a whopping $35.00! (Thank you very much, contributors). But if you don’t have the money for even that, consider hitching a ride with someone in your area through Ride Buzz. And there’s a Mega Bus option that is supposedly giving away 200,000 free rides to DC (Someone generous donor must be footing the bill for this). 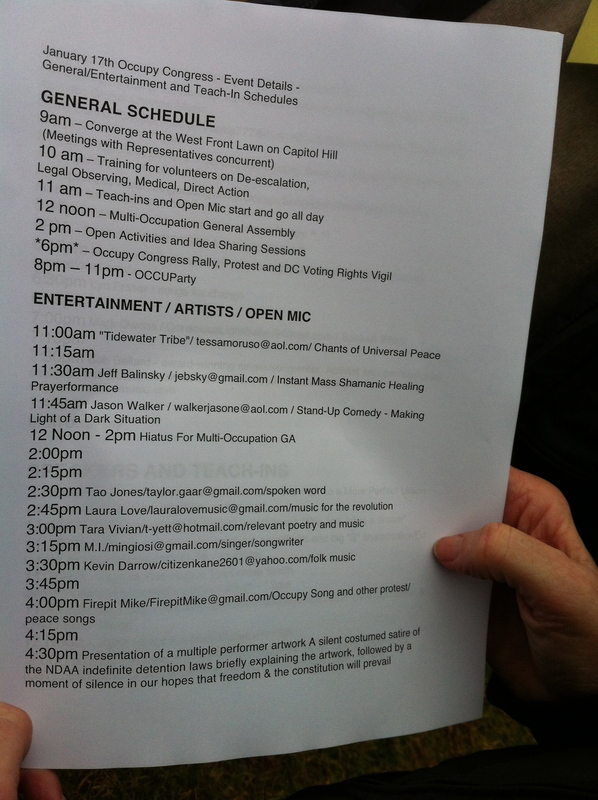 The schedule of events for Occupy Congress stretches all the way to January 23, if you feel like winter camping that long. All you have to do is show up. That’s it. Just show up and occupy the space you take up along with the thousands of others who will be joining you. Let Congress know you’re serious. 1.) Warm jacket. I recommend either a warm down parka or a fleece pullover with weatherproof shell. 2.) Thermal underwear. I can’t stress this enough. If you are going to be outdoors all day in the winter, these are a must. You can get them anywhere they sell outdoor sports clothing. Check LL Bean or EMS if you don’t have a store like this around you. Some of these items are expensive. If you’re never likely to use them again, you might want to just opt for a pair of long tights that you can buy at macys. 3.) Socks. Get lightweight wool hiking socks with liners. 4.) Sweater, fleece or flannel layered over a T-Shirt. When I go skiing, I wear a performance fabric T-shirt because cotton Ts tend to absorb a lot of moisture when you’re active and it just makes you cold. Again, outdoor sports stores have good choices here. They don’t have to be expensive. 5.) Hat, scarf, gloves and mittens. If you are in the northeast, you’ll notice an irritating habit of retailers to stop selling gloves in the middle of winter. So, stock up now if you can find them. The cheap disposable gloves that you don’t mind losing can be found in your grocery store in multiple packs. Bring them with you so that people from Florida and Arizona don’t get frostbite. Also, CVS sells little chemical heating pouches for about a dollar a pair. They last for hours. Just tuck them into your pockets. 6.) Comfortable shoes. This is THE most important item you can bring. I’m planning to wear my lightweight Merrill hiking boots because they are comfortable and you can walk for miles in them without getting tired. 7.) Last but not least, bring a water bottle. In the other occupy marches I’ve been to in NYC, the event organizers handed out water but then we have to remember to pick up our litter later and find a recycle bin and it’s a bit of a hassle. So, I recommend this cool collapsible water bottle that you can buy at Eddie Bauer. Fill it up before your event and stick it in your backpack. When it’s empty, just roll it up take it back home with you. 8.) 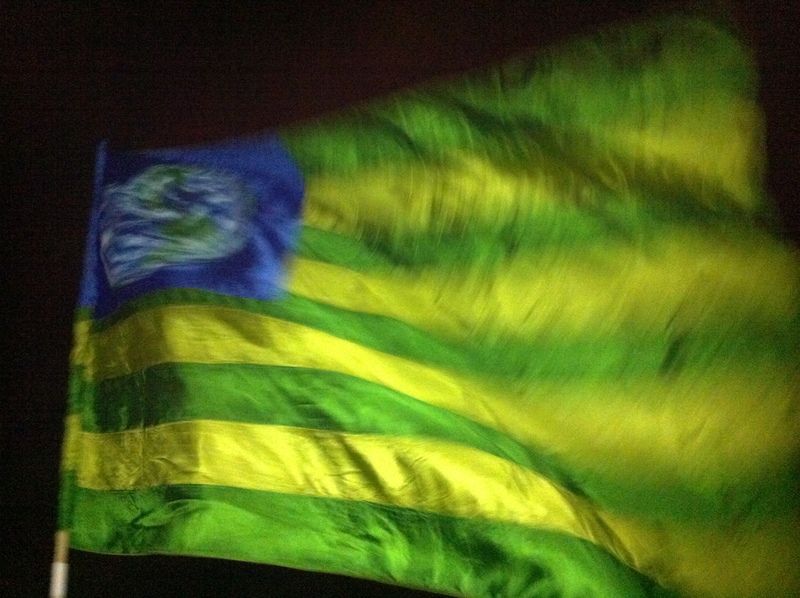 One other thing: in Zuccotti park, there weren’t any lights allowed in the evening. I never camped there but when I do go camping, I take a headlamp with me. They’re indispensible. I have a spot on the Trenton, NJ bus. The more people there, the better. I’d love to see more chemists and biologists go. There are so many of us out of work and the country doesn’t know it. We had good middle class salaries. Since 2008, the money for research has dried up. We’re in bad shape up here in the northeast. It’s not that far to drive from NJ to Washington. You could be there in 4 hours. Get a posse together and go. Marsha and Partition Function are going as are some people from Corrente. This is a birthday party I do not want to miss.